The Thailand Philharmonic begins a new season and a fresh chapter in the story of an institution devoted to the artistic needs of Bangkok’s music loving public. The opening concert of any season bristles with a special energy. The orchestra, under the direction of chief conductor Alfonso Scarano, brings a rejuvenated spirit to one of the great symphonic works in the repertory. 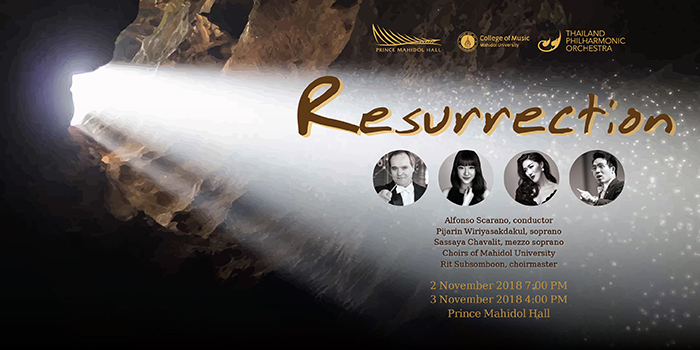 The Thailand Phil welcomes back two of the Kingdom’s great vocal talents: soprano Pijarin Wiriyasakdakul and mezzo Sassaya Chavalit. Joining them is the Mahidol University Choir under the tutelage of Rit Subsomboon. The concerts take place on 2 November at 7 PM and 3 November at 4 PM in the acoustically masterful and aesthetically pleasing atmosphere of Prince Mahidol Hall, the home of the Thailand Philharmonic.